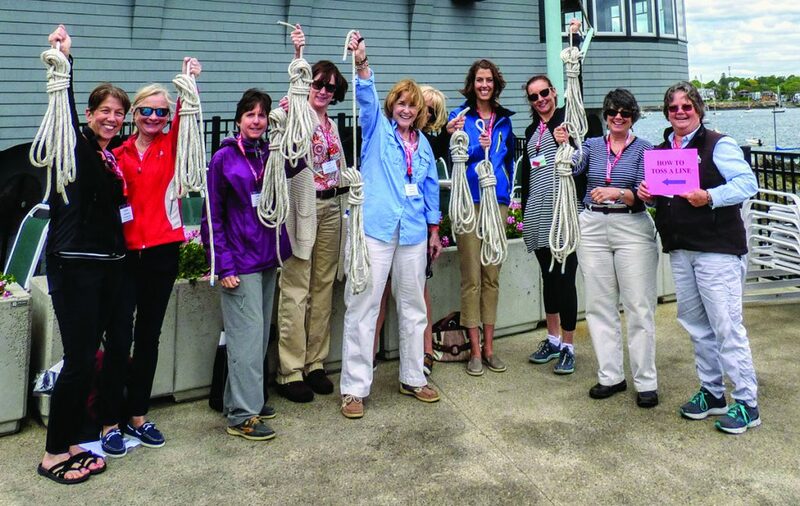 Beginning and experienced woman sailors can jump-start their sailing lives by heading to the National Women’s Sailing Association (NWSA) 18th Annual Women’s Sailing Conference slated for Saturday, June 1, 2019 at the Corinthian Yacht Club in Marblehead, MA. The event, which features hands-on land- and water-based workshops and seminars, offers women a fantastic opportunity to learn or hone sailing skills, network with other women sailors from all over the United States, and gain the confidence necessary to become a valuable crew member or knowledgeable skipper. “Women of all sailing abilities are encouraged to attend,” said event Chair Joan Thayer. “By sharing experiences, women leave with improved skills and knowledge that contribute to better days on the water. There is something of interest for everyone in the 20 different workshops. New workshops this year include Experiencing Your Ability to Swim, Wearing Foul Weather Gear, Suddenly Alone, How to Use the VHF for Clear Communications, What You Need to Know to Campaign Your Boat, Avoiding Mayhems and Missteps, What Do You REALLY Need in Your Medical Kit for First Aid?, and Boating Skills Virtual Trainer. Repeat conference workshops include Anchoring, Diesel Engine Maintenance, Hands-On Flare and Fire Extinguisher Demonstrations, Racing Basics, Sailing 101 and 102, Knots, How to Read a Navigational Chart, Plot Your Course, and Basic to Advanced On-the-Water Sailing. NWSA is proud to offer educational opportunities from some of the country’s most experienced and exceptional sailing women, including American Boat and Yacht Council Master Marine Tech Beth Burlingame. The event begins with a continental breakfast and includes raffles and a silent auction throughout the day. Participants wind down as the evening progresses with cocktails, dinner, keynote speaker Haley Lhamon of the winning boat Sail Like a Girl in the June 2018 Race to Alaska (R2AK), and the presentation of the 2019 Leadership in Women’s Sailing Award. Raffle ticket sales and silent auction proceeds will benefit the Women’s Sailing Foundation, a 501(c)3 organization that funds the AdventureSail program for underserved girls ages 9 to 14 and provides scholarships for AdventureSail participants via community learn-to-sail programs. The Sue Corl Youth Sailing Scholarship provides funds for teenage programs for underserved girls. For additional information, contact Joan Thayer at joan_thayer@comcast.net.